Dance, in its many forms and variations, is one of our most natural forms of expression. We have all experienced that wonderful moment when your favorite song comes on and you can’t help but move your body to the beat. Because dance inspires us to move our bodies, it has the ability to aid us in the aging process since activity and movement is exactly what we should be striving for as we age. Exercise is a key element to a long, happy and healthy life and it is important to maintain an active lifestyle as we age. Although seniors are recommended to participate in 150 minutes of exercise per week, many don’t achieve this amount. Dance can be a creative solution to this problem because, not only is it a great form of exercise that strengths our bodies, but it is also fun! This makes it an excellent choice for any senior looking to lead a more active lifestyle. One of the most exciting and wonderful elements of dance is the variety that can be found between the different styles, which makes it virtually impossible not to find a style that suits your individual taste and preference for ‘getting down’. There is such a wide variety of styles and each has its own unique appeal and benefit. 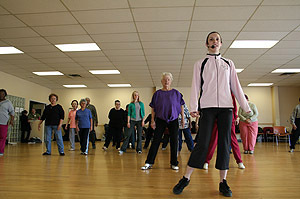 So whether you enjoy cardio-based exercise dance, such as zumba and aerobics, social and partner style dancing, such as ballroom, swing or salsa, or a more traditional technique based dance, such as jazz or tap, there will be a style and level of dance that will appeal to your own individual preference. Dance is an exciting and enjoyable form of exercise in all its variations. It also has many health benefits and is a wonderful way to strengthen our bodies. According to Justin Keogh and his team, who synthesized the results from nine difference dance-related studies focusing on the benefits for seniors, dance can help improve strength, muscle endurance, flexibility, and balance. In terms of strength, a study conducted by Dr. Hopkins and colleagues showed that seniors who participated in regular dance classes were able to perform better in a sit up test. Dance is also a great cardio exercise and its emphasis on gentle but thorough stretching increases flexibility. One area of general fitness where dance has been found to yield particularly promising results is with regards to balance. Balance is an important area for seniors to focus on because it decreases one’s risk of falling, which can cause serious injury. Dance has been found to be a particularly good way of improving balance and therefore reducing the risk of falling. In a study conducted by Verghere, which studied dancers with an average age of 80, results showed that their balance improved when compared with the control group. The benefits to balance seem to be universally true of almost all dance styles. While Verghere’s study was examining social dancing, Alpert conducted a similar experiment focusing on jazz dance and produced similar results. Similarly, Hackney’s study, which concentrated on the tango, also found improvement to balance. As a result, dance, in all its different styles and forms, can be universally beneficial to balance. While its health benefits are certainly numerous, the ultimate advantage for dance that makes it a great choice for any health conscious senior is how much fun it is and the social interactions that it provides. Unlike other forms of exercise, dance is inherently a social activity, making it a great way to get out of the house and spend time with friends while exercising and improving one’s health. As Dr. Skinner very astutely points out, “dancing leads to a continued engagement with life – past, present, and future – and holds the promise for successful aging… It alleviates social isolation and quite literally helps take away the aches and pains associated with older age.” (Dancing your Way to Successful Aging). No matter which style you are most interested in or what level you are at, dance can be your key to successful aging and is the perfect activity for every senior. So don’t be afraid to ‘bunny hop’, ‘jitterbug’ and ‘twist’ your way to healthy aging.